Possibly the cutest trench ever! A few days before quitting my job I decided to have one final shopping spree knowing it wouldn’t be the smartest thing to spend needlessly without a paycheck coming in post quit. Figured I’d stock up on some cute spring-into-summer outfits for the next gig. Now, for the past few years, I have to say that the clothing at Nordstrom has not been that great. Every time I went I found nothing. So frustrating. I shop shoes and make up at Nordy’s and that’s been about it for a long time. Until recently! Giving it another shot one afternoon I wondered upstairs (with zero expectation) only to be greeted by a lovely young personal shopper. Very friendly and dressed well… I thought ‘alright, let’s see what she’s gonna show me’. I don’t know if they got a new buyer or what, but there are some REALLY cute items up in that clothing department! Fabu personal shopper, Carrie, and I trotted all over that floor finding all sorts of fun outfits and items to play with. And then I came upon this….. The picture doesn’t do this fabu piece justice, but trust me, if you find it try it on and take it home. 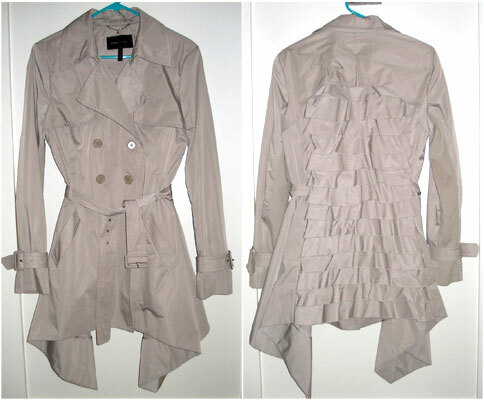 This is the most feminine and stylish trench I’ve seen in a long long time and it just looks SO good on! The best part? Of course it’s darling with dressy pieces like slacks, boots or heels… but my favorite way to wear it is over jeans, a white t-shirt and of course a cute pair of flip flops! It just adds that little extra something to an otherwise simple ensemble. 2 Responses to Possibly the cutest trench ever! That is a stylish trench coat! It’s funny how we take things for granted and accepted for decades the classic trench coat and now this stellar design comes along and rocks the scene!